Written with foreign visitors in mind. If you've only got a few days or a week to vacation on Cape Cod, these tips (from a Cape Cod native) will help you get the most out of it. You need to understand three basic things about Cape Cod to plan a happy and successful vacation here. First, you have to understand our town geography and how places are named. What you think might be a town is only a village and might not show up on your map. Second, you have to understand that Cape Cod is an island with only two small bridges for access. That means lots of traffic on Friday and Sunday. Third, weather drives everything on Cape Cod during the Summer. On a sunny day lots of people are at the beach, so there's not much traffic. Rainy day draffic in our urban centers is chaotic and frustrating. Cape Cod is a peninsular of land that begins at the Cape Cod Canal. You can't see it on the map to the left, but it's to the left of the towns of Falmouth, Bourne and Sandwich. From the Cape Cod Canal to the town of Provincetown is about 65 miles. How long does it take to get to Provincetown? I live in Sandwich, near the Canal and that's the Number 1 question I'm always asked. Well, on a sunny Summer day, when most people are at the beach, figure about 2 hours, if you take Route 6, which is an expressway with limited access. Take Route 6A, which is a local scenic road, it could take 3 or 4 hours. If it's a rainy day, your guess is as good as mine! Where is the Town of Hyannis? It's not on my map! Cape Cod in its entirety is also known as Barnstable County. Barnstable County is made up of 15 towns, one of which is the Town of Barnstable. The other 14 are: Bourne, Sandwich, Falmouth, Mashpee, Yarmouth, Dennis, Brewster, Harwich, Chatham, Orleans, Eastham, Wellfleet, Truro and Provincetown. Hyannis, which contains more hotels than any other place on Cape Cod, is a village of Barnstable. But when you're considering hotels or motels, they will give their address as Hyannis, Massachusetts not Hyannis (Barnstable), Massachusetts. All of the towns have villages. Barnstable has seven. So when you're considering a hotel. If the address doesn't match one of the town names, then you need to ask what town it's in. Another example of why this is important. The address Main Street, Barnstable is meaningless. There is a Main Street in the village of Hyannis. There is also a Main Street in Cotuit - another Town of Barnstable village. Route 6A also becomes Main Street in the Village of Barnstable - not to be confused with the Town of Barnstable or Barnstable County. Sorry about the quality of the maps. Because Cape Cod is so long and narrow it's hard to give an overview that fits. There are 3 major roads that will get you east to west on Cape Cod. Route 6, Route 6A, and Route 28. Route 6 and Route 6A are on the north side. Route 28 is on the southern side. See Route 6 that goes from Route 3 off Cape Cod to Route 6 on Cape Cod? It goes through the middle of Cape Cod all the way to Provincetown. It's a limited access highway. When you ask a native for directions, they won't call it Route 6. They'll say take the Mid-Cape Highway. That probably isn't on your map either. Route 6 is only two lanes in each direction. It can back up a few miles in the Hyannis area on rainy days as tourists attempt reach the Cape Cod Mall. But on a rainy Sunday afternoon, it can back up 15 miles going west as people attempt to reach the Cape Cod Canal and its two bridges. Route 6A isn't shown on the map above. It's to the north of Route 6, closer to the ocean. It's a pretty ride. Take it if you feel like meandering in a slow manner and seeing the sites. Route 28 starts at the Bourne Bridge and goes to Orleans where it joins Route 6. It starts out easy. But once you hit Falmouth, you're in some of the worst traffic on Cape Cod. Honestly from Memorial Day to Labor Day, I avoid it. But that's where lots of Cape Cod hotels and motels are located, so you might not be able to. Many of our tourists are from New York City, Philadelphia and Washington DC. To them our traffic is child's play. So if you're from London or Rome, you probably won't mind it either. Where's the Cape Cod Canal Tunnel? There is no Cape Cod Canal Tunnel - and there is no tunnel going to Martha's Vineyard either. Not all locals like tourists and by August they are truly frustrated by the lines and traffic. This is their humorous way to get back at you. If you ask, they'll give you bogus directions to it. So if you see someone with this permit on their car, it's not a great idea to ask them questions or for directions. 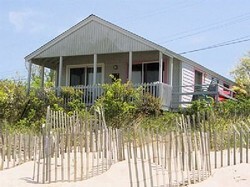 Your choice of Cape Cod accommodation really depends upon what you want to do. If you want the traditional spend the day at the beach, go out for pizza and ice cream for dinner and mini-golf after, then you should pick a spot at or near the beach. Preferably you should be within walking distance to the beach. It's horrible to get a parking space at the beach on a sunny day in the summer on Cape Cod. That's the truth. Yes, you can see the beach, but you can't park in many neighborhoods near the beach. If you do there's an expensive ticket and towing in your future. These places might be much more expensive. But if they include nearby beach access you might want to seriously consider one. Family Friendly Hotels If you've got kids and can't imagine being in a small cottage with them on a rainy day, then find a family friendly Cape Cod hotel. Many have indoor pools - a rainy day lifesaver. They also have kid-friendly events like costume and make your own sundae parties. Bed and Breakfast Inns If you're not traveling with children and prefer not being around them, then you might want to stay at a bed and breakfast that limits guest to six and over or 12 and over. Many of these smaller hotels have quite nice amenities such as pools as well. Most serve gourmet, to-die for meals. Which Cape Cod Town Should I Stay In? This is a hard question to answer. If you like art galleries then Wellfleet. Provincetown and Hyannis are known for their night life. Falmouth and Chatham have great Main Street shops and cafes. The famed Woods Hole Oceanographic Institution is in Falmouth. The National Seashore Park is in Nauset. Sandwich has the Glass Museum and Heritage Plantation. Whale watching boats leave from Provincetown and Hyannis. That's why so many people stay in the "Mid-Cape" area and travel about 30 minutes to and from each day. The trick is to think ahead about what you want to do on Cape Cod and then find a hotel nearest to most of them. Just don't forget about summer traffic - if that's an issue for you. If you've got a specific question about your Cape Cod Vacation, please ask it in the Comment Section below. I'll try my best to answer it. My husband and I are considering moving to the cape. We want to visit in the winter as well. But we were thinking Dennis or Yarmouth! Any suggestions on how to winter vaca to check it out? Please let me know when you're coming. Maybe we could catch a cup of coffee or tea. My brother lives in your town. I've always found summer traffic on the Cape to be horrendous. I went there with two of my sisters the summer before last, though, and the beaches were exquisite! I'd like to visit again soon. There have been many novels written about Cape Cod. Kurt Vonnegut lived in West Barnstable. Norman Mailer had a home in Provincetown. Poet Mary Oliver also lives in Provincetown. I knew nothing about Cape Cod until now, except, of course, having heard the names you mention. These names sounds like something out of a novel or two or three. Great article. Planning seems essential for a happy and successful Cape Cod vacation. I'm pining this to my See the World board. I also want to be on the beach (which beach) and I would like to do a lighthouse tour. I'd love to go to that part of the country - the names are great - very English! i've seen so many movies and read books located in the area - so maybe one day! From the sound of it though, maybe not the height of summer - when would you say is peak season? Very useful information. I don't think that I ever told you that my first child was conceived on a trip to Cape Cod. We had a beautiful week there, driving up and down and staying in several areas. So beautiful, and I think it is about time to go back. My favorite place that we stayed was a bed and breakfast in an old house in Provincetown, and there were lots of shops and galleries to visit along the way. The historic neighborhood of Dorchester in Boston, Massachusetts is home to the James Blake house. Built just over 350 years ago, it is the oldest house in Boston. Treasure, shipwrecks, pirates and dreams of gold. This is the story of a real adventure that discovered fabulous treasures off the shores of Cape Cod, Massachusetts.